Dave Mustaine is the lead singer, song-writer and guitarist for heavy metal band Megadeth. Prior to Megadeth he was also the lead guitarist of Metallica. In 2009 he was ranked #1 the 100 Greatest Metal Guitarists, by Joel McIver. He also currently manages the Canadian metal band Baptized in Blood. Dave recently donated some items to the Little Kids Rock charity auction. 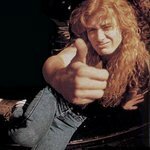 Google trends for "Dave Mustaine"
We don't have any videos related to Dave Mustaine.